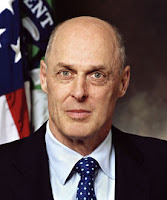 Hank Paulson- The Donald Tsang of the Financial Crisis? One of the key persons that are trying to move United States out of this financial crisis is the Treasury Secretary Hank Paulson. While trying to understand what is being done to resolve this issue, his name comes up a lot of times. So it is good to see what type of person this guy is. "I love my kids too much to leave them money" is a quote attributed to him in a very long New York Times article about Paulson. I think his net worth is about US$500 million so that is a lot of money that he is talking about. He has a fine cv which you can read about in Wiki, a footballer, an Eagle scout, an MBA from Harvard and an ex CEO and Chairman of Goldman Sachs etc. The article from New York Times asked if he can defuse the crisis and from what is observed so far, it seems that Paulson is trying very hard to do that. There maybe people who think that using US$700 billion of taxpayers money to detox the financial mess is being too kind on those financial fat cats who were living it up not too long ago. However, not intervening and letting market forces dictate what happens is too scary a thought, as it could plunge the world into a depression that makes the Great Depression look like a cake walk. The Fed Chairman, Ben Bernanke, had studied the Great Depression in depth and would know that the non intervention by the government at that time excabated the effects of the Great Depression at that time. You can read the implications of Ben Bernanke research into the Great Depression here at the Wall Street Journal. Who is this Donald Tsang? Well he was the Financial Secretary of Hong Kong during the Asian Financial Crisis and for me, he was the guy that stopped the speculative attacks on Asian currencies by taking an interventionist approach using, yes- tax payers money. Asian currencies were attacked by speculators and were devalued one by one. The next to fall was supposed to be either Hong Kong or Singapore, they chose to attack Hong Kong and got a bloody nose. Donald Tsang used about HK$120 billion to defend against speculative attacks by buying stocks. When they sold off these shares later as the Asian economies recovered, the profit came to be about HK$30 billion. If the $700 billion that US uses to defuse the crisis can earn such a return, it will be money well spent. United States has two very able financial leaders in Hank Paulson and Ben Bernanke. Between the two of them, we all hope that they go down in history as the two persons that saved everyone's bacon.